Black Bean Soup — Burrito in Soup Form! Congratulations to Small Footprints, winner of the Rad Soap Wonderland Changa giveaway! Check your e-mail–you’ve got one waiting! Raise your hand if you like burritos! How about soup? How about a soup burrito? Okay, not literally. That would be messy. 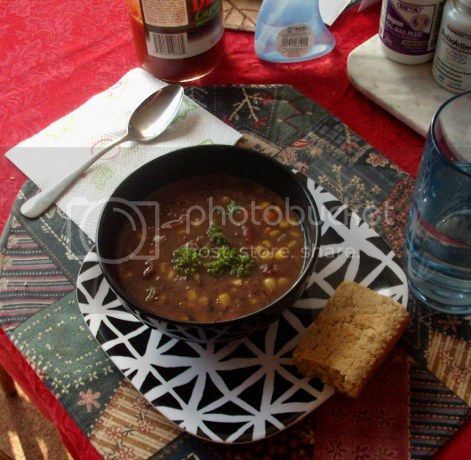 But that’s sort of the concept behind the black bean and corn soup in 1,000 Vegan Recipes. While I can’t say for certain that Robin Robertson set out to create a soup that was like a burrito in a bowl, that’s how it struck me, right down to the awesome flavor. 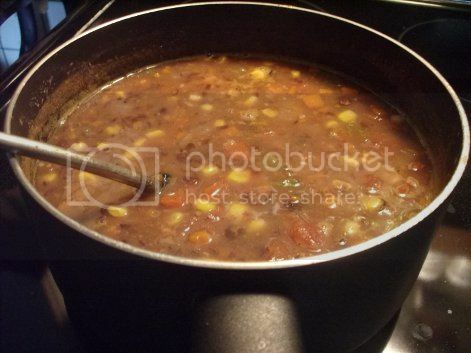 This soup has pretty much everything you’d put in a black bean burrito: beans, corn kernels, bell peppers, onions and, incongruously, a carrot. (If you put carrots in burritos, let me know how it tastes. Might be interesting to try!) In terms of how it’s made, the recipe is fairly unremarkable until you get to the bit with the immersion blender, which always makes me way more excited than it should. I’m kind of a kitchen appliance geek, so any time I get to use the food processor, blender or immersion blender, I get the biggest kick out of it. At first I was afraid that I’d blended it too much, as it was only supposed to be partially blended for creaminess and not pureed. But it turned out that there were a lot more beans and corn hiding at the bottom of the pan, so it still had a great texture. The really cool thing about this recipe, though, and one that made it even more burrito-like to me, was the instruction to add a splash of hot sauce to individual bowls when serving. If you’re asking yourself, “Hot sauce in soup? ?”, the answer is yes. Very much yes. 1,000 Vegan Recipes also happens to contain my favorite cornbread recipe, called Fired Up Jalapeno Cornbread. Though I should probably say that it’s my favorite recipe to adapt for cornbread. I’m not sure I’ve ever made it 100% as written. This time was no exception. Since there was already corn in the soup, I left out the corn kernels. I also didn’t have any jalapenos on hand, so that was a no-go too. And I think swapping the oil for applesauce and decreasing the sweetener probably turns it into an entirely different recipe. An entirely different, tasty recipe that went really well with the soup. 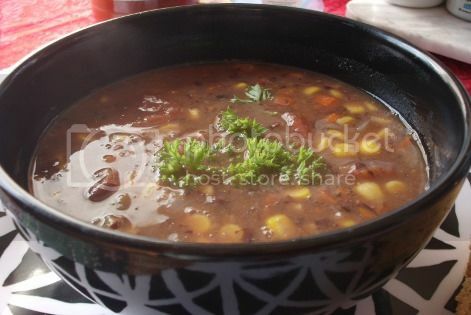 This is now my favorite black bean soup ever. I’ve tried Muir Glen, Amy’s and Trader Joe’s canned varieties and they all have their merits, but none of them are as good as this one. I like the fact that homemade soup is more versatile and customizable, and it winds up far less salty than commercial canned soups. I can see myself whipping up batches of this for lunches on chilly days, or to take to potlucks and share! Do you have a favorite “go-to” homemade soup recipe?